Across the country, states are working to develop the plans required by the Every Student Succeeds Act (ESSA), the latest reauthorization of the federal Elementary and Secondary Education Act of 1965. One area of ESSA—Part A of Title II—is specifically focused on “preparing, training, and recruiting high-quality teachers, principals, or other school leaders.” Despite the Trump Administration’s proposal to eliminate Title II-A funding in its recently-released budget blueprint, a focus on human capital remains a critical aspect of state and district strategies for school improvement and ensuring equitable access to effective teachers. Title II-A of ESSA provides states and districts with new latitude to think beyond a “paint by numbers” approach to educator quality. 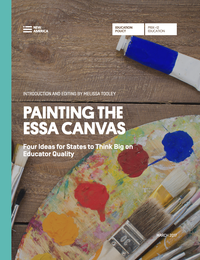 In a new brief, Painting the ESSA Canvas: Four Ideas for States to Think Big on Educator Quality, New America interviews education policy experts, selected for their individual and organizational expertise, to offer insights into how states’ ESSA plans can reflect such an approach. Experts provide big ideas in four key areas allowed by Title II-A: 1) educator preparation; 2) educator recruitment and retention; 3) educator evaluation and support systems; and 4) comprehensive professional learning systems. In addition to providing innovative, actionable ideas for states, the brief also highlights key themes that arise throughout for how states can support equity and excellence in their schools.